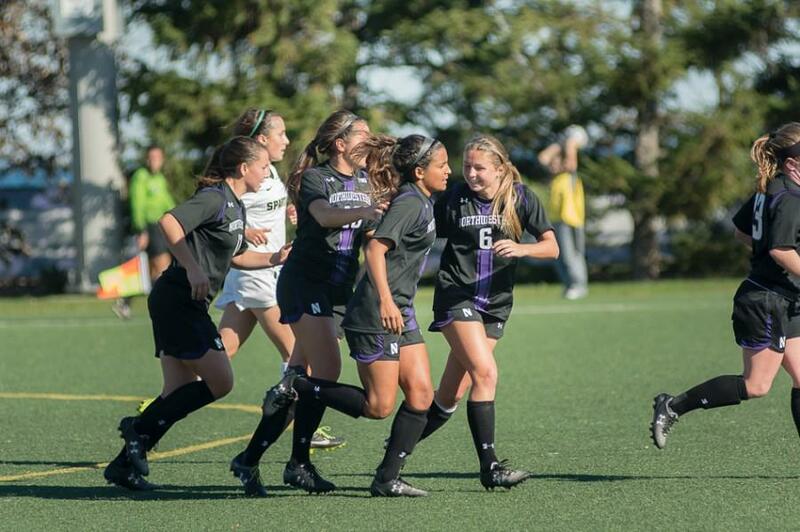 Junior Nandi Mehta celebrates with teammates after her goal in Northwestern’s 2-0 victory over Michigan State on Sunday. The Wildcats won and tied over the weekend, improving their winning percentage to an even .500. Northwestern came into the weekend looking to build on two successful Big Ten outings and did just that. The Wildcats defended their home turf well, playing Michigan to a 1-1 tie and dominating Michigan State for a 2-0 victory. The Cats got it done with defense, like they’ve done for most of the year. Freshman goalie Lauren Clem, whose cousin Courtney Clem manned the goal for the Spartans on Sunday, was also quick to give credit to the dominant Cats defenders for allowing only six Spartan shots. Lauren Clem also mentioned the stellar play of the backups, a point echoed by Moynihan. Moynihan said he thought his backups outplayed the Spartan backups, referencing the fact that both goals were scored by players off the bench. In the 44th minute, senior forward Katie Landgrebe was able to get a long shot off, which ricocheted off the hands of Courtney Clem. Sophomore midfielder Maria Grygleski was there for the rebound, and the Cats gained a 1-0 lead and momentum going into halftime. In the 62nd minute, junior midfielder Nandi Mehta gave NU an insurance goal with a free kick from the edge of the box, which bounced on the ground and got behind Courtney Clem for the unassisted goal. It was the type of game-sealing goal NU lacked earlier in Big Ten play and often led to close losses. Instead, the Cats rolled to victory and put themselves in a position to stay alive in the Big Ten and NCAA Tournament races. Moynihan conceded the team is still on the outside looking in for the Big Ten Tournament, currently sitting ninth and needing some help to sneak into the eighth spot. However, he remains confident the Cats can compete for a shot in the NCAA tournament with a win in their final game against Minnesota. Moynihan said he was curious to see what the team’s RPI would be in the next standings release, saying the team would have to be in the mid 40’s for even a shot at the NCAA tournament.